Learn more about suicide prevention and the warning signs of suicide through the “It’s On My Mind” page: http://www.facebook.com/itsonmymind. Check out other World Suicide Prevention Day activities at http://www.iasp.info. To learn more about mental health conditions and suicide, visit one of The Jed Foundation’s sites at http://www.jedfoundation.org, http://www.ulifeline.org or http://www.halfofus.com. You’ll find links to many other resources through these sites. If you or someone you know needs help immediately, please call the National Suicide Prevention Lifeline at 1-800-273-TALK. Alison Go of U.S. News & World Report cites a study from Academic Medicine (originally reported by Inside Higher Ed) which suggests depression affects 21.2 percent of medical students. The rates is 11.2 percent higher than that of the general population. And unfortunately, 13 percent of black medical student reported suicidal ideation in the survey, suggesting that the demographic is more likely to suffer from suicidal thoughts. And yet another study about suicide… The University of Gothenberg in Sweden performed a study on people who had nightmares following a suicide attempt and found out that they were five times more likely to try committing suicide again. The conclusion is based on a meager sample size of 165 patients but I suppose it’s a start. While it appears that other sleeping obstacles do not raise the risk of multiple suicide attempts, patients who have attempted suicide seem to battle sleeping problems on a regular basis. It is normal for patients that have attempted suicide to suffer from sleeping difficulties. Some 89 percent of the patients examined reported some kind of sleep disturbance. The most common problems were difficulty initiating sleep, followed by difficulty maintaining sleep, nightmares and early morning awakening. Interesting observation considering that I have pretty much all of the common problems with the exception of early morning awakening. Finally in a semi-cool story, a 22-year-old New Jersey guy who was friends with an 18-year-old Californian over the Internet called California police when he found out the 18-year-old said he would attempt suicide. Although it sounds like the teen (his name was not disclosed) is pretty upset about being saved (I know the feeling), it’s a (somewhat) happy ending compared to what happened in November when a Florida teenager streamed a webcast of him committing suicide by dying of a drug overdose. The Florida teen died before police arrived. Emotional depression along with economic recession? Steven Good, a chairman and CEO of Sheldon Good & Co., a major U.S. real estate auction company, may have shot himself, according to police. Rene-Thierry Magon de la Villehuchet, a 65-year-old French investor, killed himself after losing $1.4 billion in the Ponzi scheme that Bernard Madoff ran. Kirk Stephenson, 47-year-old English financier and COO of Olivant Ltd., jumped in front of a train in September (the real climax in the economic collapse). Calls to the National Suicide Prevention Hotline went from 412,768 in 2007 up to 540,041 in 2008. 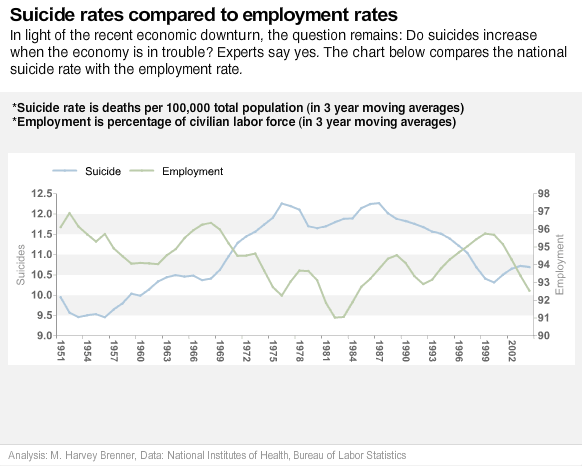 Unemployed people are two to four times more likely to kill themselves than those who are employed. So what about these wealthy and powerful men who have recently killed themselves? Mental health experts say it’s impossible to say why they did it, but they say that people who kill themselves have an underlying psychological issue, such as depression or bipolar disorder, so it’s not only about the money. So I pose a question: Do all those who commit suicide have a mental illness? Or is it possible to kill oneself without being mentally ill? I babysat the 21-month-old son of a friend on Thursday. He's an adorable, sweet little kid. Very affable and social. With the addition of a new brother, he's been craving the attention that he used to have as an only child so he's always happy when someone takes the time to sit and play with him. His mother had to go to court to contest a traffic ticket and she took the baby with her so I offered my (free) babysitting services. I'm not a babysitter and I normally don't offer to babysit kids alone because I'm not very good with them and most young children don't like me much. However, I've really grown to love my friend's son—we'll call him Danny—and felt like I could take care of him without too many problems. We were upstairs on the second floor in his bedroom and I talked to his mother about a few logistics before she left. Finally, she kissed Danny goodbye and headed down the stairs. Since Danny's only 21 months, he needs to be carried down the stairs. When he saw his mother disappear, he began crying (much to my surprise and much to my dismay). My first thought was, Oh great. Now, he's crying for his mommy. This isn't going to be as easy as I thought. I tried to sit down with him on my lap in the bedroom but he was extremely fidgety and got up and began running to the edge of the steps. Fearful of a fall (remember I don't have much babysitting experience! ), I grabbed him, picked him up, and shut the door to the bedroom. Realizing this meant mommy wasn't coming back right away, he cried even harder. Now I was really at a loss of what to do. I saw a little toy helicopter that he had been playing with earlier. The helicopter made noises and I tried to hand it to him and pressed all sorts of buttons to amuse him. He wasn't fazed. Danny kept right on crying. Suddenly feeling desperate, my next thought was, I can't have this kid crying until his mother comes back. She's going to think I hurt the poor child. I searched around the room and found a teddy bear and handed it to him. He wasn't interested in that either. Finally, my eyes fell upon a toy set up like a two-level parking lot with a car ramp that twisted around to the ground. Several small cars sat on top of the lot. Remembering Danny loved to pick up cars and hand them to people one by one, I tried the tactic as a last-ditch effort. I picked up the first car and held it open in the palm of my hand. He kept crying but looked down at it. I grabbed a second car. His crying began to die down and he began to look at the two cars with curiosity. I snatched another car. He stopped crying and simply looked at me with a blank stare, wondering what I'd do next. I picked up another car and held them flat out on my hands for a few moments, letting him take in the number of growing vehicles. Finally, he gave me a little smile. I started rolling a car up and down his belly and he began giggling. Problem solved. We stayed busy until his mother came home. I expected him to run and cling to his mother after she got home but he gave her a quick glance and wanted me to keep playing with him because he was having so much fun. That was pretty satisfying and felt like my first solo babysitting gig had been a success. Just like I'd distracted Danny from the sadness of his mother's disappearance, I'm finding that a lot of people in my life have been trying to distract me from the sadness and emotional pain that have been plaguing me lately. Forgive me for being cynical but the data sounds fishy. I can’t pinpoint why but it does. The suicide numbers and patient involvement data seem to deviate some from the numbers listed in Merck’s PR issued last March. (I’m seeing 11,000+ patients vs. 9,929 patients.) Regardless of the clinical trial data, it appears that the FDA as of yet have not reviewed post-marketing data. “The physician really needs to review whether there are symptoms that have developed since patients started taking the medication, if there’s an underlying depression that was there before medication started. The FDA says they’ve completed analyses of submitted clinical trial data but their “safety review will continue” for several more months before they come to a concrete conclusion. For customer testimonials, check out medications.com that has over 2,300 people reporting side effects and askapatient.com that has an average 2.3 rating from 524 reviewers. The most commonly reported mood-related side effect on both of the sites is irritability. I’m being hit by suicidal thoughts again. Hard. I’m not going to the hospital but if these thoughts keep pummeling me, it’ll become a consideration again. I’m walking a fine line here because my husband’s family has had a suicide hit close to home earlier this year and they don’t need to experience another loss. I try to keep in mind how important I am to many people that I know: my husband, my in-laws, my mom (I’m her only child). I try to visualize the grief my mother would experience losing her only kid. It’s worked so far. I can only pray that it lasts. In the meantime, I’ve had my husband hide my belts. I ended up in the hospital in October 2006 after my husband woke up just in time to find me kicking a chair away in an attempt to hang myself from an air vent. After what now seems like a short reprieve, I constantly glance up at the ceiling air vent in our bedroom thinking about trying the hanging thing again. I’m sure I could find something else to use if I really wanted to but I’m trying not to dwell on the idea too much. Lie #1: Nobody cares about you. Answer: I have a husband, a big family, and wonderful friends who love and care for me. I’d be missed. Lie #2: You don’t make a difference in this world. Answer: I have a 98-year-old grandmother who loves me to pieces, I have a mother who I bring so much joy to, I have a husband who tells me I’m the best thing that’s happened to him, and I have a mother-in-law who thinks that I’m so cool, she wants to spend time with me. I do make a difference. Answer: My husband tells me all the time that I’m worth something to him and that he’d be lost without me. If only for him, I’m worthwhile. I'm on "Day I-don't-know" of lamotrigine (generic Lamictal). It's been at least 2 weeks. I haven't had any significant side effects except for extreme fatigue. I am often tired. Some days, I can give myself a boost of energy by playing the Wii Fit (which I snagged Saturday afternoon) and other days, exercising just wears me to out to the point where I head to the shower and then to bed. I can have 3 cups of coffee, never become fully awake, and still go to sleep at a decent time. I'm still not sleeping well. Haven't slept well since before I went into the hospital in October 2006. I can't remember the last time I had truly restful sleep. My symptoms remain at bay. I haven't had many suicidal thoughts or impulses. In fact, some days, I can go without thinking about suicide at all. I can't say it's all the medicine — my counseling and faith play a much bigger role — but I'm sure the medicine helps. I've recently noticed that I'm not suffering from as much social anxiety. Again, I don't know if this is due so much to the medication as it is to the resurgence of my spiritual life. I ventured out on Sunday to a meetup writers workshop group that I'd never been to before. It was extremely weird. Not the situation, but the fact that I walked into a room full of strangers, made myself comfortable on the couch at the coffeehouse and offered input quite freely without worrying about what the others thought of me. I even had the audacity to network with a woman who works at a trade magazine in the area. How strange. I don't have balls. This is not me. What the heck has happened to me? Postpartum Progress reports that the Melanie Blocker Stokes MOTHERS Act bill did not pass. Spreading lies like this did not help. The FDA recently approved Stavzor, a valproic acid delayed release capsule, for the treatment of bipolar disorder, seizures, and migraine headaches. Wow. That’s covering the gamut. The drug looks like it’ll be competing directly with the Depakote brand. Stavzor is approved for the treatment of manic episodes associated with bipolar disorder, as monotherapy and adjunctive therapy in the treatment of patients with complex partial seizures that occur either in isolation or in association with other types of seizures, and for prophylaxis of migraine headaches. The drug will hit the market in mid to late August. A recent AP article notes that more than 22,000 veterans contacted the veterans portion of The National Suicide Prevention Lifeline hotline since its inception last July. The government reports that the hotline support has helped to prevent more than 1200 people from committing suicide. The Veterans Administration (VA) estimates that 6500 veterans commit suicide annually. In light of recent news regarding the increase in Marine suicides, the effectiveness of the suicide hotline is offers significant promise. The hotline receives an average 250 calls each day from veterans that have fought in Iraq, Vietnam, and Afghanistan. The issue of soldiers with mental illness has recently come to light with studies showing that 1 in 5 soldiers returning from Iraq and Afghanistan have shown symptoms of post-traumatic stress disorder. The issue of the high suicides rate has been a high priority of the VA since mental health director Ira Katz tried to hide the significant number of suicides committed by veterans. The National Suicide Prevention Lifeline is available 24 hours a day by calling 800-273-TALK (8255); veterans should press “1” after being connected. Psychologists are now saying that hitting and yelling at children is causing an increase in mental illness, which has manifested in ages as young as 3 years old. News.com.au reports that 1 in 7 children are affected by a mental disorder. “We have seen a 60 per cent increase in demand for our child anxiety classes in the past six months,” said [Dr. Kimberley O’Brien, of the Quirky Kids Clinic at Woollahra in Sydney]. It sounds more like the article is speaking of children who are exposed to constant physical and emotional abuse. If that’s the case, shouldn’t there rather be an increase in parenting properly classes? Finally, a bit of sad news: police in Connecticut report than 10-year-old killed herself apparently by hanging. Police do not believe that foul play was involved. I can’t imagine being 10 and feeling suicidal. It was tough enough at 14. 20 people annually or 9,000,000 people annually. Those are the numbers that the Golden Gate Bridge (GGB) Board of Directors will need to choose between in October. GGB officials are considering a proposal to erect suicide barriers on the bridge. Public forums were held on Tuesday and Wednesday to gauge public reaction to the five options designed to deter suicides. The cost of erecting one of the barriers is estimated between $40–50 million. members of people who jumped to their deaths from the bridge – insist a barrier is needed. Any barrier. “Overwhelming 75 percent” prefer no barrier? That’s not good. Opponents of the barriers say it will ruin the aesthetic view of the bridge for the yearly estimated 9 million visitors. Liz Spikol on The Trouble With Spikol linked to an article in the Chicago Tribune in which author Steve Chapman discusses whether buying a gun is a suicidal act. Chapman argues "not really." Is it? attention." I ran into that quite a bit in high school. which stem from thoughts that likely were never verbalized. seeking to die "just because." plan. The common thread that runs through all suicides is hopelessness. So to wrap this series up, is it possible to prevent someone from committing or attempting suicide? The nation’s suicide rate (11 victims per 100,000 inhabitants) is almost precisely what it was in 1965. In 2005, approximately 32,000 Americans committed suicide, or nearly twice the number of those killed by homicide. The National Institute of Mental Health says that 90 percent of all suicide “completers” display some form of diagnosable mental disorder. Both elderly men living in Western states and white male adolescents from divorced families are at elevated risk. [T]he person who best fits the classic definition of “being suicidal” might actually be safer than one acting in the heat of the moment — at least 40 times safer in the case of someone opting for an overdose of pills over shooting himself. In a 2001 University of Houston study of 153 survivors of nearly lethal attempts between the ages of 13 and 34, only 13 percent reported having contemplated their act for eight hours or longer. To the contrary, 70 percent set the interval between deciding to kill themselves and acting at less than an hour, including an astonishing 24 percent who pegged the interval at less than five minutes. running through domestic gas lines had been reduced to nearly zero. During those same years, Britain’s national suicide rate dropped by nearly a third, and it has remained close to that reduced level ever since. Just as with homicide, researchers have long recognized a premeditation-versus-passion dichotomy in suicide. For generations, the people of Britain heated their homes and fueled their stoves with coal gas. While plentiful and cheap, coal-derived gas could also be deadly; in its unburned form, it released very high levels of carbon monoxide, and an open valve or a leak in a closed space could induce asphyxiation in a matter of minutes. This extreme toxicity also made it a preferred method of suicide. “Sticking one’s head in the oven” became so common in Britain that by the late 1950s it accounted for some 2,500 suicides a year, almost half the nation’s total. Those numbers began dropping over the next decade as the British government embarked on a program to phase out coal gas in favor of the much cleaner natural gas. By the early 1970s, the amount of carbon monoxide running through domestic gas lines had been reduced to nearly zero. During those same years, Britain’s national suicide rate dropped by nearly a third, and it has remained close to that reduced level ever since. How can this be? After all, if the impulse to suicide is primarily rooted in mental illness and that illness goes untreated, how does merely closing off one means of self-destruction have any lasting effect? At least a partial answer is that many of those Britons who asphyxiated themselves did so impulsively. In a moment of deep despair or rage or sadness, they turned to what was easy and quick and deadly — “the execution chamber in everyone’s kitchen,” as one psychologist described it — and that instrument allowed little time for second thoughts. Remove it, and the process slowed down; it allowed time for the dark passion to pass. A recent article in New York Times magazine suggests that those who exhibit suicidal behavior or have had unsuccessful attempts are least likely to die by way of suicide. The author, Scott Anderson, delves into the psyche of what drives a person to commit suicide. And he attempts to answer the "what" question by evaluating the "how." ABC News covers the potential legal wrangling that might occur for Internet users as a result of the MySpace suicide case. I mentioned this in a recent post. In some sad news after this Memorial Day weekend, Greg Mitchell at the Daily Kos reports that Chad Oligschlaeger, a 21-year-old Marine suffering from PTSD, committed suicide. According to family members, he was taking 8 different kinds of medication to control the disorder. Mitchell has an update on the story. In some (somewhat) good news, mental health specialists from across the board are offering free services to current troops in an effort to help out with the shortage of mental health assistance in the military. We have recently learned of the suicide and tragic loss of Hannah Bond. We’d like to send our condolences to her family during this time of mourning. Our hearts and thoughts are with them. My Chemical Romance are and always have been vocally anti-violence and anti-suicide. As a band, we have always made it one of our missions through our actions to provide comfort, support, and solace to our fans. The message and theme of our album “The Black Parade” is hope and courage. Our lyrics are about finding the strength to keep living through pain and hard times. The last song on our album states: “I am not afraid to keep on living” – a sentiment that embodies the band’s position on hardships we all face as human beings. If you or anyone that you know have feelings of depression or suicide, we urge you to find your way and your voice to deal with these feelings positively. I blame MCR for Hannah’s death about as much as I blame Nirvana and “grunge” music for making me suicidal. (I don’t blame Mr. Cobain at all.) Granted, Nirvana’s music put me in a mental state where I was much more open to depression but I can’t blame a band for my actions. Besides, every generation has the band that every parent feels the need to hate. Nirvana and “grunge” music were “it” for the 90s. MCR and “emo” will soon be out for the 00s. We’ll see what the next band and music genre will influence teenagers in the next decade. I have an appointment with my psychiatrist on Tuesday morning. I’m not quite sure what to do. My husband and I have had physical fights in the past where he has had to restrain me because I wouldn’t go to bed and I wouldn’t sleep. It would be 4 in the morning and I refused to sleep and I’d fight him tooth and nail. I don’t know why. I have no problem wanting to sleep at 2 pm. Make it 2 am and there’s too much to do suddenly. I have the superhuman ability to get things accomplished between midnight and 5 am more than I can during the hours of 9 am to 11 pm. Right. So now it’s almost 1 in the morning and I have nursery duty at church later in the morning. Then I have a hair appointment in the afternoon. Then I’m paranoid about what my hair stylist thinks of me. She says she’s my friend but I wonder if she’s just pretending to like me because she feels sorry for me. I’m really lame you know. People at work acted nice to my face and then dissed me behind my back. She does the same thing to others, why wouldn’t she do the same to me? She just keeps me around and kisses up to me because I tip well. As reported by BET News, Juanita Bynum, a televangelist who is in the middle of divorcing her husband Thomas Weeks III, admitted that she wanted to kill herself when she saw her marriage falling apart. Suicide? If you believe that I have a bridge I want to sell you. She is too infatuated with herself to do that. We need to stop listening to this person of continuous drama. She does not practice what she preaches. Many people reach a point in their lives where they either have suicidal thoughts or consider committing suicide but move past it. I’m sure Bynum falls into this category, and it’s understandable. J.K. Rowling recently admitted to something similar while she was in the middle of divorce proceedings. "Your life is a publicly traded company. You may have majority ownership, but you still are subject to a Board and to your shareholders. If you want to kill yourself, everyone you have touched in any way gets to vote. Good luck." "You have a responsibility to improve the lives of those around you." Excuse me?! When did THAT become part of the constitution? NOBODY has the responsibility or even the capability to improve anyone else’s life! Hell, you’re a Doctor and you don’t take responsibility for improving anyone’s life! I’ve noticed that suicide is the taboo mental health topic even among the mentally ill. I’m going to go on a brief narcissist trip and mention that I received few comments on my last suicidal post. To be honest, I figured more people would have chided me for my distorted thinking. Makes me wonder to be quite honest. If I decided that I was going to commit suicide (which I’m not right now), would you support my decision or would you make a case for me to stay alive? What would you say? Can I be even more narcissist and hope that I get at least 5 comments on this post? Thanks in advance. I’d been meaning to talk about this story but it’s progressed faster than my typing hands can keep up. An e-mail sent around at the Veterans Health Administration among Dr. Ira Katz, the VA mental health director, and other officials, discussed the issue of hiding the number of suicides committed by veterans from the public—an estimated five out 18 of them being under VA care. Now, a number of senators (and bloggers) are calling for Katz’s resignation. I’m tempted to go crash my car. Again, the boy cried wolf. Right now, I’m going through what my old pastor used to say is a “spiritual winter.” I just fall into moments when I just cease praying and reading my Bible for whatever reason. I’m not mad at God or anything; I still struggle with believing in a God that I’ve never seen with my own two eyes. But then I think about the specific events that have taken place in my life and I know He exists. With that being said, I sat in my car this morning with the ignition turned on, ready to drive my car over the bridge into the Schuylkill River. I was ready to run home, make the stupid “goodbye world” post on this blog, text my husband “I love you. Goodbye” and then ram my car into a divider on I-76. It’s the worst suicidal thought I’ve had since I ended up in the hospital in October 2006. Ok. I recently posted on Pete Wentz, bassist for Fall Out Boy, who has openly admitted to struggling with depression and suicidal ideation. He recently said that his relationship with Ashlee Simpson and and regular therapy sessions have helped him to overcome depression. There is no mention whether he took psych drugs as part of his recovery. But Wentz is convinced that although he still battles with mental health issues, his relationship with Simpson has made him more emotionally balanced. He says, “The hardest thing about depression is that it is addictive. Spoken like someone who really struggles with depression. Wentz’s story underscores some points from my “about me” post that emphasizes the need for encouraging and healthy relationships. In a study, the first of its kind, scientists have found that websites encouraging suicide pop up more frequently in Internet search engines than those which aim to prevent it. While one in five sites that popped up on the click of a mouse were dedicated suicide sites, and over 50% of them encouraged, promoted or facilitated suicide. Over 43 of the websites studied contained personal accounts of suicide methods. In contrast, only 13% focused on suicide prevention or offered support, while another 12% actively discouraged suicide. The article mentions that the three highest ranked sites were pro-suicide. The top four sites gave detailed information on various ways to commit suicide. Most of these pro-suicide hits were found via Google and Yahoo. MSN had the highest hits of prevention and support sites. As I resist the urge not to investigate the data further, I think of a Web site I was introduced to recently called everyminute.org. According to the site, about 30,000 people commit suicide in the U.S. annually. Suicide also is the second highest cause of death of those in the 25–34 age range. Untreated mental illness tends to play a big role in suicides. This statistic makes me glad that my mental illness is being treated, however, I still struggle with suicidal thoughts (I have lately). The silver lining in this is that I have a higher chance of overcoming my suicidal actions and behavior thanks to my counseling, medication, and self-education via this blog and the blogs of others. In a cumulative analysis recently provided to the FDA of Merck’s randomized, double-blind, placebo-controlled clinical trials, which included over 11,000 adults and children in over 40 studies who were treated with SINGULAIR, there were no reports of suicidal thoughts or actions and no completed suicides in the patients who received SINGULAIR. Additionally, in a cumulative analysis recently provided to the FDA of Merck’s randomized, double-blind, clinical trials that compared SINGULAIR with other active agents to treat asthma (which included over 3,900 adults and children who were treated with SINGULAIR and over 3,400 who were treated with other asthma therapies), there was 1 patient who attempted suicide who received SINGULAIR, and there were 3 patients who attempted suicide who received other asthma therapies (including inhaled corticosteroids and long-acting beta-agonists). These studies were not designed to compare the rate of suicide in patients taking SINGULAIR with the rate of suicide in patients taking these other asthma agents. Did Merck report that one suicidal attempt when compared to "other active agents to treat asthma"? It doesn’t say anything in their patient safety or prescribing information when I checked. Perhaps someone can find out whether they reported this in their clinical trials? In the meantime, the Singulair section of medications.com is ablaze with parents who are now expressing concern over their children’s well-being on the drug. Apparently, issues have cropped up with the drug even before the FDA announced their investigation. She checked the Merck website and the information sheet she got from the pharmacist on Singulair and found no red flags, so they were stumped when Cody started acting out of character. I have to hand it to Merck: Once the Millers reported Cody’s death, they immediately updated Singulair’s warnings to include suicidal thoughts and actions. However, Cody died on August 4, 2007. Merck updated their information two months later. As of February 29, 2008, the FDA still hadn’t taken any action. Despite the updated warnings, however, doctors and pharmacists were unaware of the new information. The Singulair website carries the updated side effects, but you have to search it out in the patient information PDF on the fourth of five pages. If you check with the FDA, you’ll find nothing. That’s because they admit they haven’t updated their website on Singulair since 2001. According to the FDA’s MedWatch safety information, they have only begun their investigation today. They say it will take 9 months for them to “complete their investigation.” We may not hear of the FDA’s conclusions until early 2009. If this is a single, isolated incident, the FDA may just say the results are inconclusive and allow Merck rip the warning off their patient safety information. It is also important to note, however, that Singulair has also been linked to depression and anxiety. Thanks to Gianna for sending me a link to an ABC News article about the relationship between religious faith and depression. The article analyzes whether faith can help or exacerbate a mental illness. The exacerbation, as referred to in the article, mostly comes from the stigma of mental illness within the religious community. Being punished by your religious leader for an unavoidable disorder sounds bad enough — yet it’s often compounded with tacit warnings against leaving the condemning sect. When I was forced to leave a fundie conservative Christian college midyear because of my depression, my pastor at the time was clearly disappointed with my decision not to return the following year. I decided that attending a college close to home as a commuter student would be better for my mental health. There was no need to scare more roommates with my occasional mixed episodes. I felt like I’d failed my pastor, my church, and my God. God more so than anyone else. I convinced myself that He must be upset with me – disappointed in me. It’s not easy to recover from depression when you feel like the One who dangles your life from His fingers is pretty pissed at you. The quote above is the entire point of this post and the preceding posts on this subject. Suicide’s a difficult and divisive topic. People never seem to run out of opinions on the matter. Jeffrey Black’s booklet was directed to an audience that wanted to know how to help a suicidal individual. I added a couple of things that I thought were relevant, but for the most part, Black is on target. I stopped harping on this through my posts, but I remained dismayed at the straightforward approach and lack of empathy in the book. While a person struggling with suicidal thoughts shouldn’t be "babied," he should be treated with compassion and care. Tough love works on some people, but its potential for backfire is great. Many people who consider suicide are extremely fragile and the slightest criticism could further convince them that they need to kill themselves. (FYI – I am one of these.) If you’ve known the person for a long time, assess his normal-tempered personality. From there, decide whether he is capable of accepting a bit of a heavy-handed push. A general rule: Avoid tough love if the suicidal person normally wouldn’t consider you "a loved one." So this post concludes my longest-running series on suicide. This series has been in the works since October, when I entered the hospital, but I never had any time to really devote to it. The semi-meticulous person I am, I went through my posts and tried to edit them as much as possible. (OK, with the exception of this one.) A few mistakes might slip through, but for the most part, they should be relatively readable. The point of this series wasn’t to bang non-Christians over the head with a Bible. (Uh, so to speak.) The booklet I dissected came from a Christian point of view, but I think there was a lot of helpful information, not just for Christians, but for anyone who wants to help a suicidal person. It’s not foolproof and it certainly isn’t the "be-all and end-all." It’s a guideline and a good start. Purchase the book at Amazon, if you’re interested. A hopeless Christian is a paradox considering that Christians should have reason to hope. But when faced with trials of life, “keeping hope alive” proves difficult. A failure to recognize God’s wisdom. A failure to desire what God desires. An unwillingness to view time the way God does. Are my hopes in the situation getting better or in Christ? Are my hopes in me or in Christ? Are my hopes in other people or Christ? When a Christian’s focus isn’t on Christ, everything is hopeless. I struggle with answers how to get a Christian from a point of hopelessness to hopeful ness. This lack of hopelessness is what drives me directly to suicide. “Explore [the person’s] perceptions of hopelessness.” How hopeless is the person feeling? Can the situation be rectified or is it hopeless? 1. Presenting problem – Assessment begins by evaluating the problem that triggered the downward spiral. This is difficult to do if the person can’t identify any triggers. 2. Background information – Analyze the person’s life and personality to gain a better understanding of how and why he is driven to a point where he considers taking his own life. A good warning sign: If someone says, "I can’t deal" repeatedly. "I can’t deal" really means, "I don’t have the appropriate coping skills to handle my situation." 3. Substance abuse – While a person who abuses drugs or alcohol may not be suicidal, the likelihood that a depressed person who abuses drugs or alcohol is. 4. Resources – Encourage the (potentially) suicidal individual to seek out a support network: family, friends, church, therapists, or social groups. If a person feels needed, he is more likely to realize that his death will have a significant impact. Perhaps he’ll think twice before making an attempt. B. "Determine how often the person has suicidal thoughts and how intense or compelling they are." Frequent "passing" thoughts are no longer passing thoughts. C. Dry run. A person contemplating suicide might have “tried out” the way he plans on killing himself. If a person admits to attempting a “dry run,” the person likely is in extreme danger of following through. 6. Noble End – A person who is at the point of beautifying suicide as a glorious end to his life is completely disillusioned and should be seen as a high risk. Watch out for talk of "No one needs me anymore" or "Everyone would be better off without me." An addendum: A person who says "I hate myself" may be a suicidal risk, but not always. An admission of self-hatred provides evidence that he may want to eliminate the hatred in some way. These include financial problems, illness, bereavement, relational conflict, or public humiliation. Black notes that situational crises tend to act as a “catalyst to suicide,” driving the person to believe he or she has no other solutions to solve his or her problem(s). This, above all things, is the biggest reason behind a suicide attempt. If people felt like they had other options to their problems apart from suicide, most would take the alternate routes. In a suicidal moment – whether planned or not – the suicidal person is thinking about ending the “pain.” Death itself is not the goal; it’s an end to emotional pain. Death seems to serve as a means to that end. While problems get unbearable and circumstances may seems bleak, instead of looking for assistance, those who are suicidal convince themselves that only death or loss of consciousness can release them from emotional pain. A person who attempts to overdose on medication seeks one of two things: death or loss of consciousness. Abuse of medication that requires hospitalization provides a legitimate reason to “escape” the problems of life. Abusing medication is a person’s way of saying that he needs, as Black puts it, “an emotional vacation.” The person feels overwhelmed by the stressors of life and temporarily need to block out all distractions. At this point, it is safe to say a person is mentally ill. The need for escape from problems is the mind’s way of saying that it needs time to recover and become mentally healthy again. Abusing medication is the desperate way of doing this. Extreme psychological pain related to unmet psychological needs. A view of self that says she cannot tolerate such intense pain. An overwhelming feeling of hopelessness, and the belief that she is helpless to solve problems. A sense of isolation or desertion accompanied by the belief that others cannot, should not, or do not want to offer support, nurture, or care. All four are likely to be present to classify someone as suicidal. Two out of four does not a suicidal person make. Desperate, yes, but not undeniably suicidal. problems + inability to change problems = intolerable pain. A person turns to suicide if he is suffering from severe depression; has poor coping strategies; feels that his stressors are too much to handle; and in his heart, has decided that as a result of these circumstances and feelings, he must end his life. While the book had me put off, I did glean a couple of things from it, mainly things that pertain to Christians who struggle with suicidal ideation. The key here for Christians is to focus on “the Way, the Truth, and the Life.” This is especially difficult to do when a person doesn’t know the next path to take, what to believe, or desperately wants die. The Biblical view of Christianity holds that a person who has trusted in Jesus Christ as his Lord and Savior and commits suicide is not condemned to hell. However, the booklet deals with issues leading up to this point and does not focus on suicide per se. While suicide is viewed as a psychological act born out of a depressive state, the author correctly states it is “the act of a sinful heart.” All Christians must come to terms that many mental illnesses are a result of a sinful, fallen condition. Christianity rejects the teaching that “all people are inherently good.” From a Biblical standpoint, that’s a fallacy. Psalm 53:3 reminds readers, “There is none who does good, not even one.” Those who believe in God must accept that they are fallen, sinful creatures incapable of consistently doing good in and of themselves. Depressive and suicidal tendencies stem from this sinful nature. Life as a non-Christian can be senseless and meaningless because there seems to be nothing to live for other than the self. A belief in Jesus Christ as Savior gives life a brand new sense of meaning. But even a Christian can lose track of that. Again, the inability to remain focused on God stems from a sin nature. Paul lives his entire life with purpose. He endures the suffering because of the good he knows will come out of it. Paul is “strengthened” to face the challenges that God has given him through the Holy Spirit. While Black explains how Paul overcame his difficult trials with courageous faith, his application flies over the head of any depressed believer. The above may be encouraging to a believer who is disappointed by trials, but it is an application out of the grasp of someone who is suicidal. A more appropriate application would be King David in the Psalms, “Why are you cast down, O my soul, and why are you in turmoil within me?” (Psalm 43:5) or rather Elijah, who after a great spiritual victory, prays to God, “It is enough; now, O Lord, take away my life.” (I Kings 19:4) Perhaps even a suicidal person can relate to Job, “"Why is light given to him who is in misery, and life to the bitter in soul, who long for death, but it comes not.” (Job 3:20-21) Black overlooks believers with applicable moments of despair and opts to use the apostle Paul as example for hope. Here, the cliché is applicable: a person must go through the darkest part of the tunnel before he can see the light. Not only did I feel as though Black throw Paul’s example in for a “See? This is how a true believer should act,” he immediately delves into how “suicide is a sinful act.” Pitting depressed people against a great apostle like Paul is just an awful reminder that they just don't “stack” up. Contrasting a suicidal person with a spiritual giant is yet another reminder as to why he needs to die, not to live. As I mentioned before, using Elijah, David, or Job would have been a more empathetic approach. He adds that suicide is an “expression of self-centeredness contrary to our position as creatures responsible to a Creator.” Suicidal thoughts remove God from being the primary focus of life and make people gods in their lives. Suicide seems like a noble way of dying (a form of narcissism) while it is essentially a slap in the face to God. Suicide says to God, “I don’t trust that you can help me through life so I’m taking matters into my own hands,” whether the individual is aware of God or not. The book is directed at readers who want to know how to help a suicidal person. I quote much of the book and offer some comments, but I also try to add some important pieces that I think Mr. Black overlooked. The booklet relies on the Bible to support many of its points so it is heavily Christian-themed. However, there are other interesting tips that anyone – Christian or non-Christian – can use to help those who are suicidal. I’ll be honest: I read the book myself, and as a person who struggles with suicidal thoughts, I found it to be disappointing. This probably stems from the fact that suicidal people are not the target audience. Those who care about suicidal people are. Regardless, reading the book allowed me to gain some insight into my thought processes when I become suicidal. These thoughts aren’t evident to me when I am suicidal, but they do occur. Perhaps the coming book analysis can be a helpful tool for readers of this blog, not only for those who want to help suicidal people, but also for those who have attempted suicide and are looking for a way to thwart the process. In February 2004, I tried to kill myself. I don’t remember how now. But he pleaded with me to go see a doctor and get some help. Since I was 21, I no longer qualified under my mother’s health insurance so I tried to avoid docs as much as I could. My pediatric (PCP) doctor continued to treat me despite my age. Dr. X diagnosed me with depression and said, "Since you don’t have medical insurance, I’ll give you some samples of Paxil that a drug rep gave me." Welcome to the beginning of my first experience with psych drugs. I remained on Paxil through July. I wasn’t accustomed to taking medication each day so I’d take it for a day or two on and off. But no more than that. If I didn’t take it for three days, I knew it was time to get back on it. I’d suffer from dizziness and "brain shivers." It was also the first time that I developed eyelid twitching. I went back to Dr. X and told her that Paxil wasn’t working. She told me that she knew I wasn’t consistent in taking my meds. But she still switched me to another med. A crucial year in college. I was attempting to graduate that semester, juggle responsibilities as a reporter and copy editor for the college paper, manage a long-distance relationship, and complete a 50+ page honors paper. After accidentally reporting incorrect data on an investigative piece that I thought I’d thoroughly researched, university directors came down HARD on me. The managing editor made it a bigger deal that it really was (according to my teacher and newspaper advisor), freaking me out and sending me into a tailspin. I adhered to my Lexapro regimen much more carefully, but my depression worsened. By the end of October, I’d quit my job at the paper and found myself unable to get out of bed except for late afternoon and night classes. In November, I had to cut back from 16-18 credits down to 12 – just enough to keep me a full-time student. Of course, I didn’t graduate that semester. I’d went to a psychologist (recommended by my PCP) who gave me "tough love" advice for $75 per half-hour. The "tough love" approach wasn’t for me and actually made me feel worse about myself. I continued to worsen under his care. In February, I switched to a Christian-based counselor and dramatically improved. She listened to me for $75 an hour and at the end of the session, gave me helpful advice. The support of my counselor and boyfriend helped me to get through the trying time. Bob helped pull me through graduation the next semester despite occasional moments of relapsing (into bed). Bob, not accustomed to the severe depression at first, immediately became frustrated and used the "pull yourself up by your bootstraps" mentality. After all, despite his depression, he was still going to work, still living. When he noticed that strategy wasn’t working, he did some research on depression and became a little more sympathetic. However, our relationship began taking a turn for the worse: we began arguing about pretty important things – where we’d live and whether we’d have biological children. We took "breaks" on and off and after several attempts at discussing breaking up, we tried to do so. Of course, it didn’t last. His depression kept him from feeling confident in our relationship and his ability to handle my depression. He conveniently left out how he was worried that his depression would conflict with mine. Wow. I never realized all the responses that my post on “Suicide” would garner me. Again, I am not proud of my tendencies toward suicidal actions. I have some opinions on the following comments that I’ll reserve until afterward. “My brother committed suicide via hanging in our garage. My parents will never be the same some 17 years later. I have attempted suicide, unsuccessfully; my sister killed herself, my grandfather killed himself with arsenic, my sister-in-law's mother gassed herself, my step-father's mother took an overdose. We do suicide in my family. All of us have been severely affected by it; I still cry at the thought of walking into my sister's flat and finding the dried pool of blood – an image I will never get out of my head, some 15 years later. I have kept myself alive through all the pain because I have 3 children who I could not bear the thought of damaging in that way; I have been living for them, not for me. However, I have tremendous sympathy for all those who attempt or succeed at committing suicide – I say succeed with emphasis. Any person who has ever felt the depths of despair of not being able to face another hour of the intolerable pain of deep depression, would understand the longing to end that pain. Living through it takes an unselfishness which is arguably admirable, arguably the biggest form of self-harm and denial possible. For someone to continue to live with that pain so as to avoid giving someone else the pain of grieving is not necessarily the kindest act; watching your loved one living (or rather "existing") with the pain of depression is arguably as bad, if not worse, than grieving for their death. They are existing in hell for that period of time it takes for them to crawl out of that hell. Nobody wants the person they love to live in hell – why keep them there??? Who is being selfish: the person who takes their life to end their suffering, or the person who watches that person suffering day in day out and doesn't want them to die because they themselves cannot stand the idea of their own grief and suffering when their loved one commits suicide? I personally cannot "judge" which person is being the more selfish. I wouldn't want my worst enemy to have to endure that pain, day in day out, and to know that the only reason they are keeping themselves alive is for my benefit. Ultimately each of us has the choice to live or die and that choice deserves respect and compassion, not condemnation. I need a new subject header for “Mental health news.” It’s so blah. I need something snazzy. Perhaps “Loose Screws News”? Okay, nevermind… That’s what I get for being a former copy editor. Renamed as of 2/16/2009. According to the Delhi Newsline, yoga can help with cases of severe depression and schizophrenia. (Hm, interesting.) Patients who took yoga classes in addition to meds improved more rapidly than patients only on meds. The connection with yoga seems to be the relaxation component — outdoing counseling and “talk therapy,” which can aid treatment in a mentally ill individual. My husband thinks I suffer from sleep apnea – he claims I stop breathing sometimes in the middle of the night. I’m going for a sleep assessment sometime in February so I’ll let you know if I come back with a CPAP (continuous positive airway pressure) machine. I’ve had increased dreams (or nightmares, what have you) on these psych meds. I haven’t been excessively suicidal and I hope it’s no indication of more suicide attempts on the way. *sigh* Were any of the surveyed patients on meds like Effexor and Lamictal? And finally, News 24 reports that children who suffered from neglect and abuse are more likely to develop severe depression as adults. The study, published in the Archives of General Psychiatry, says the data specifically shows that “depression is a consequence of… abuse.” Um, who wouldn’t be depressed after such a traumatic experience? How do physicians differentiate between major depressive disorder (DSM-IV term for clinical depression) and post-traumatic stress disorder? Ah, once we get the answer, we can use it as a Jeopardy! question. "Talking about suicide or asking people if they feel suicidal will not put the idea in their heads or cause them to commit suicide." Agreed – unless the person is thinking about it or was on the fence to begin with. I identify with Dawdy’s article on a variety of grounds and many of his words have me thinking. People who really know me — those closest to me — know that when I’m suicidal, it’s extremely hard for me to not show. I withdraw from social contact, refuse to make eye contact, become extremely quiet or reply with a succession of short, one-word answers to questions, or corner myself in a seat or in bed with my head hanging down, eyes spacing off into somewhere. Those who know me should and can know when I’m suicidal. It becomes so obvious that I don’t need to say anything. I usually don’t tell anyone, but my body language speaks volumes. I'm both a suicide survivor and an ideator. I've tried overdosing on pills many times to no avail. I've also tried jumping out of cars. Each time, the driver has caught me before I could roll out into the street. Most of my other "attempts" have been strong ideations: drinking Windex, stabbing myself, shooting myself in the head, driving my car into a wall, jumping in front of a train, jumping off a high building — TO NAME A FEW. "In each case, there was little warning. One minute I'd be muddling through a weeks-long depression—wound up, angry, and lethargic all at once—and the next I'd be on the lethal precipice." I can't really remember planning any suicides. I don't plan suicide attempts; the ideations hit me as an impulse. I become obsessed with the thought and I can't distract my mind. It's like a train headed full speed into a wall with no reverse gear. This is me when I am suicidal. My latest obsession has been shooting myself in the head with a gun despite Dawdy's stat that "It is uncommon for women to kill themselves with a gun." I've never had access to a gun but if I did, I'd be dead by now. The act of pulling a trigger is final. So much more so than any act of suicide. A person can survive a stabbing, a jump, overdosing, or self-designed accidents. But once a person sticks a gun inside the mouth and pulls the trigger… it's difficult to miss. Survival isn’t impossible but not likely.